How to publish photo gallery, photo flipbook? How can I convert quantities of photos to flash photo album or photo flipbook? powerful custom settings, this flash photo gallery builder enables you to create stunning photo flipbook with amazing page turn animation. 8. Click "Convert to Flipping Book" and choose output form (HTML, ZIP, EXE and CD) to publish flash photo flipbook. 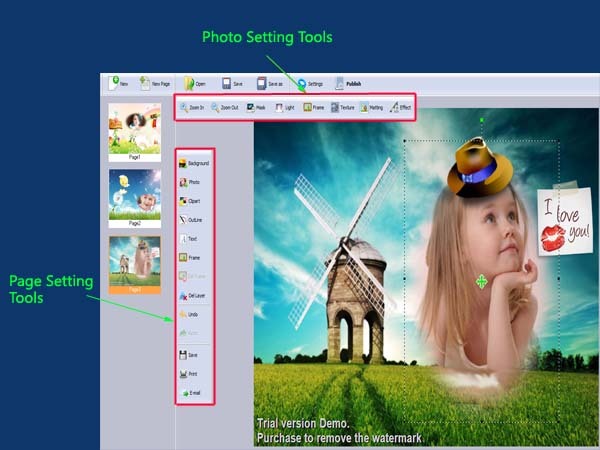 Photo SlideShow Builder - Convert photos to professional slideshows in EXE, SCR, WMV, AVI, MPEG, CD, DVD mode.